The Apollo Range is a smart collection of real wooden picture frames, ideal for displaying awards and certificates. 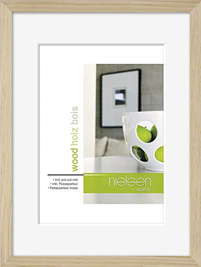 The Apollo Range from Nielsen is a smart collection of real wooden picture frames, ideal for displaying awards and certificates. These affordable frames come with a mount that not only protects your artwork but also gives it that extra professional touch. The Apollo can be used to stunning effect as a poster frame, family photo frame or your favourite A4 certificate. If you have more than one piece of art or a collection of photography, try mixing different styles and colour tones to create a real ‘gallery’ feel.